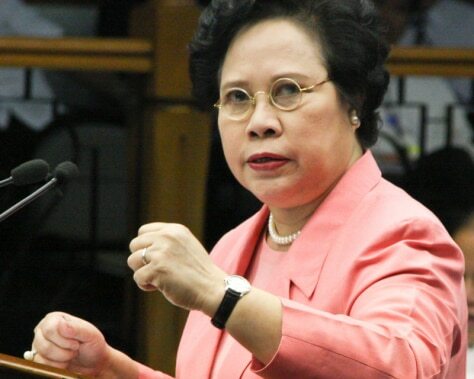 Senator Miriam Santiago will undergo 6 weeks of treatment to battle Lung Cancer. Sen. Miriam Santiago admitted that she has stage 4 lung cancer but the feisty senator remains optimistic as the illness is not spreading in her body. She remarked that she might be back to work after 6 weeks of treatment. "Allow me to introduce myself to you as the only senator who has been diagnosed with lung cancer as of last week. I have cancer of the left lung which makes it hard for me to breathe," she admitted in a press conference this Wednesday morning. Sen. Miriam is known to be one of the frontrunners in battling government officials who allegedly were involved in the PDAF scam. "I don't know what the reaction of my enemies will be, on what hand I might die, and that they could get rid of me, of I might survive and get rid of them," she stated. She shared that her body contains "behavioral mutants" that battles cancer cells, hence, the disease is not spreading in her body. "They discovered I have a very rare condition which is called behavioral mutants or mutancy by themselves, by my cells in my left lung, have developed a genetic mutation, making them impermeable to cancer and which gives them the energy to fight off cancer nearby." The senator relayed that she will be taking a tablet which has the same effect as chemotherapy to counterattack her disease. “I'll be taking a tablet and in effect it will give me all the benefits of chemotherapy without the side effects. So I hope to see you in 6 weeks fully cured of cancer." Miriam revealed that the doctors did not find out why she acquired lung cancer.